As you stand looking in at your old kitchen to consider the possibilities, you may want to rearrange a lot of things. One element you shouldn’t consider moving is the plumbing. Leave your sink right where it is. Rerouting plumbing could add upwards of $5000 to a kitchen remodel. Every granite supply store offers remnants. These are the pieces of granite that might have been cut off from another project. There is nothing wrong with these remnants and you could discover that they will fit perfectly on your countertops. They are also a very good deal. If you end up with some remnants of your own, then put them to use as small cutting boards. If you are replacing your kitchen appliances, then you should broaden your search. You might discover that a floor model is a much better deal than something sitting back in the warehouse. Even an appliance with a small ding could offer a great reduction in price. Whatever appliances you purchase make sure you do so in a timely manner. You don’t want to wait until the last minute for those deliveries. 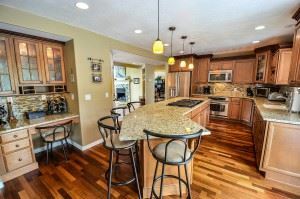 If you currently have wood flooring in your kitchen, then you should think about refinishing versus replacing. Even if you’re knocking down a wall, you can patch up that gap with a piece of wood that is stained to match the rest floor. If you’re replacing tile or vinyl floors, then look into less expensive options like sealed cork. Not only are they great for your budget but there actually better for the feet! Labor is a vital component of any kitchen remodel but it comes at a cost. Anytime you can save a labor day you’ll be ahead of the game. That is why you should think about taking care of your own demolition. Before you make the commitment take a good look at the things, you’re taking apart. You’ll discover it’s not that complicated. The only thing you need to accommodate for is the cleanup. One call to Junk King Detroit can take care that. Junk King Detroit will dispatch a pair of movers and truck big enough to hold all the construction waste from your demolition. Don’t get the job done quickly and efficiently and at a great price. You can always count on Junk King Detroit to help with any kind of rubbish removal including kitchen remodel debris. This entry was posted in Detroit Junk Removal and tagged debris, junk King Detroit, kitchen remodel, rubbish on June 26, 2017 by Junk King. Last updated June 26, 2017 .